Free Science, Social Studies and Health lessons developed by teachers to inspire digital-age students in support of UNICEF Canada! Curated lessons with interactive quizzes that mirror your province's science, health and social studies curriculum – all for free. 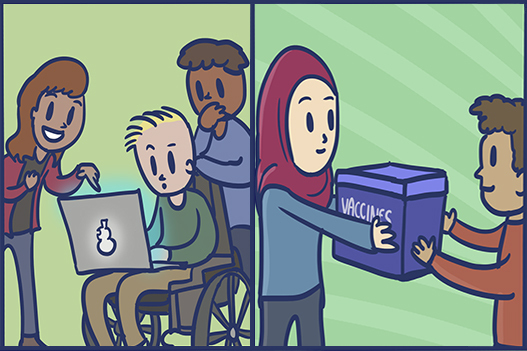 For every quiz that students complete, we'll donate a vaccine to someone in need! Here's how it works. 544,130 questions answered and 29,947 vaccines earned in support of UNICEF this school year. 707,472 questions have been answered and 38,584 vaccines have been earned for children in support of UNICEF since March 2018. Connect your curriculum to global citizenship. Free Science, Social Studies and Health lessons to inspire digital-age students. Developed by teachers, for teachers! Egberts H9s earned 1 vaccine(s) when they completed a quiz.